We approached our public engagement in three ways. Firstly, we carried out an education event, in which we opened up our project and selected members of our team to talk about iGEM, both in general and specifically regarding our project. This was a tremendous experience for all involved and it gave us the chance to talk to the general public, engage with their questions and in some cases fears about the project and genetic modification as a whole. Secondly, we wrote several articles for our school student newspaper. Finally, we developed a board game through which the principles of iGEM were turned into a (hopefully) accessible and fun game for people to enjoy. Amongst the general public there is a great deal of misinformation concerning genetic modification in general, much of it fuelled by “scare stories” published by newspapers. As a result, there is still a certain stigma against genetic modification, which has been unusually persistent throughout the years. A recent survey by AAAS showed that there is a large difference of opinion (51%) between the general public and scientists over whether it is safe to eat genetically modified foods, with less than half (37%) of US adults thinking it was safe to eat genetically modified foods. Whilst obviously not all such concerns are applicable to our case (it is unlikely that anyone would want to eat a BPV, for a start), we decided to take a deeper look at the case against genetic modification. The first and most prominent case presented by opponents of genetic modification is the argument that scientists do not have a full understanding of what they are dealing with and so are likely to make unforeseeable mistakes with regards to genetically-modified organisms. This is a valid point - we can attest to the need for trial and error in synthetic biology as in all other areas of science. Even for experts in the field, genetic modification remains a particularly difficult task - a great deal of variables are always unknown. Moreover, there have been cases in which GMOs have proved to have had a negative effect on the consumer (Seralini et al., 2011), where a review of 19 studies found genetically modified soy and corn fed to rats coinciding with liver and kidney problems amongst the rats.. This is further accentuated by the fact that trials for certain genetically-modified organisms can be as short as 90 days, meaning long term consequences can go undetected. However, whilst this is reason to be cautious, genetically modified organisms, in particular food, have been on the market since 1996, and often in huge quantities - for example, it is estimated over 94% of soy grown in the US to have been modified to resist herbicides, and 88% of corn to have been modified to make them resistant to disease or predation. Moreover, as experience with genetic engineering grows, it is possible to argue that genetic engineering is a safer alternative to traditional breeding, as scientists are able to control which packets of genes are transferred as opposed to reproduction, in which thousands of genes are transferred in fairly random fashion.The next problem presented was not a critique of genetic modification as a whole, but instead that of execution. Haidee Swanby, who works for the African Centre for Biodiversity based in South Africa, said "We would like to see genetically modified organisms (GMOs) banned. Our maize seed sector is owned by just two companies: small players are being cut out and it's producing large volumes of very low quality food for South Africa.” Whilst it is clear that there are advantages to having GMOs, (vastly increased yield, improved efficiency, hardiness etc. ), this can lead to a monoculture in which a single crop can outcompete the rest of the competition. Due to this, it can lead to a single crop dominating and being used for all purposes, making it vulnerable to a single virulent disease wiping them out completely. To raise awareness of this and other issues we carried out two education events on the 22nd and 25th of September, in which we opened up our project and selected members of our team to talk about iGEM, both in general and specifically regarding our project. 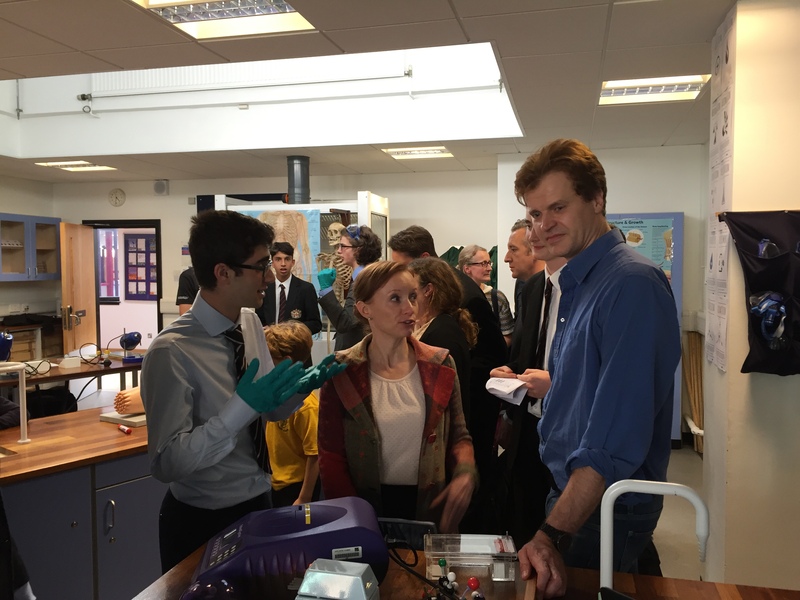 This was a great experience for all involved and it gave us the chance to talk to the general public and schoolchildren, engage with their questions and in some cases fears about the project and genetic modification as a whole. Figure 1. Jake talking to members of the public about our project, what can be achieved with synthetic biology even in limited amounts of time and why this field is extremely safe. A number of different questions were asked, with some of the more common ones detailed below, along with our responses. Q: Can we use this on humans? A: Yes. All organisms use a universal code, meaning genes can be used interchangeably between very different organisms. In fact, this has already been done, as we transfer human insulin genes from the host cell to a bacterium in order to have a reliable source of human insulin to treat diabetes. Q. What is genetic engineering? A: Directly manipulating an organism’s genome using biotechnology. This is traditionally done with restriction enzymes to cut a particular gene(s) and then transfer it to a different organism. However, there are many new methods, for example CRISPR, a modern technique which is more precise and faster for identifying specific parts of DNA. Q: What about the ethical/moral ramifications? A: There are many to think about. Whilst it is true that a future in which those who are not “designer babies” are discriminated against would prove a grim one, it is important to note that genetic discrimination exists even now. For example, over 92% of those embryos diagnosed with Down’s syndrome are terminated, and the story is similar for many other genetic diseases. On the other hand, genetic modification can mean a potential end to all diseases related to errors within the genetic code, and can result in humans becoming smarter, more physically able, and more adaptable. We wrote several articles for our school student newspaper, the Citizen, over the last few months. 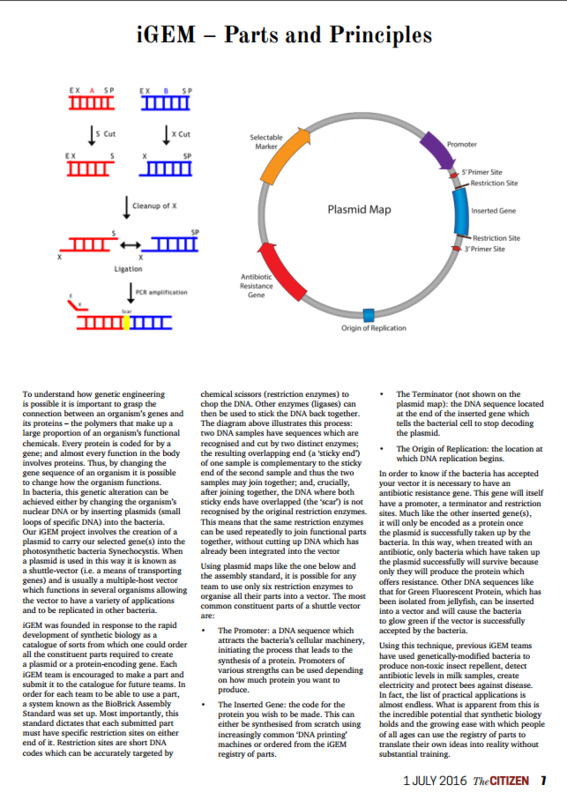 These can be seen on our school's archive here, and through this we sought to make genetic modification, normally a fairly forbidding topic, more accessible to the general public. In the most recent, we discussed our parts and gave short summaries of what they were intended for, along with a short overview of what genetic modification consisted of. The earlier one took more of a deep dive into the actual process of genetic modification, looking at real world practical problems that were faced by our iGEM team and how they were solved. We also looked at the potential applications of previous iGEM applicants and what the competition itself actually consisted of. We tried to make the articles as readable as possible without compromising scientific content, and received positive feedback from members from our school. Figure 2. Our article announcing the project to the school and briefly outlining what we will be doing. Figure 3. Follow-up article, focussing on synthetic biology as a field. Figure 4. Article exploring the idea of biological parts and a standard registry. Figure 5. Article focusing on our own project. Finally, we developed a board game through which the principles of iGEM were turned into a accessible and fun game for people to enjoy. The game revolves around collecting parts of DNA in order to gain enough to travel to the Giant Jamboree. Figure 6.iGEM inspired board game. But, before you can start working on your project and earning your way to the Jamboree, you must collect all the components for safe working. As trailblazers for our school, we were forced to learn a lot of things very quickly, and many of the errors made by us could have easily been avoided with the benefit of hindsight. As a result, this has made very clear to us how important it is for us to provide advice to the following teams from our school. 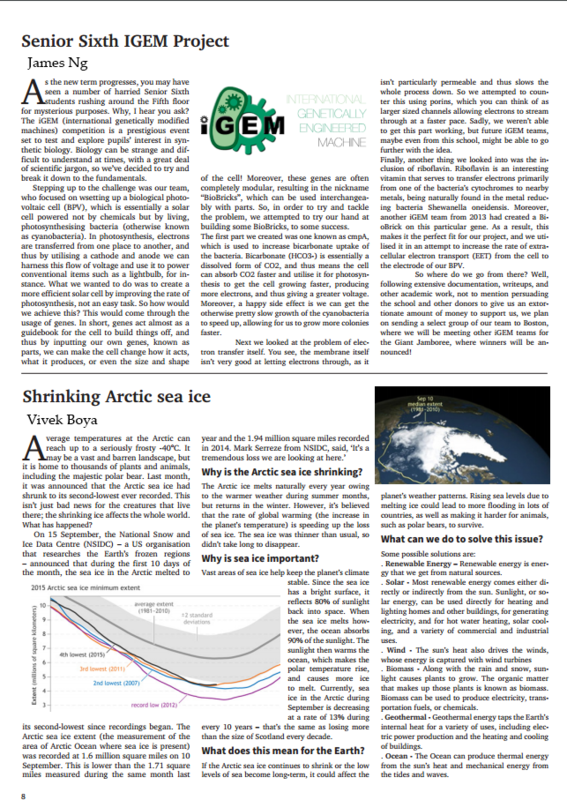 Through our public outreach, articles, education events, and our new iGEM game, we have attempted to distil down the essential information in an easier to understand medium. 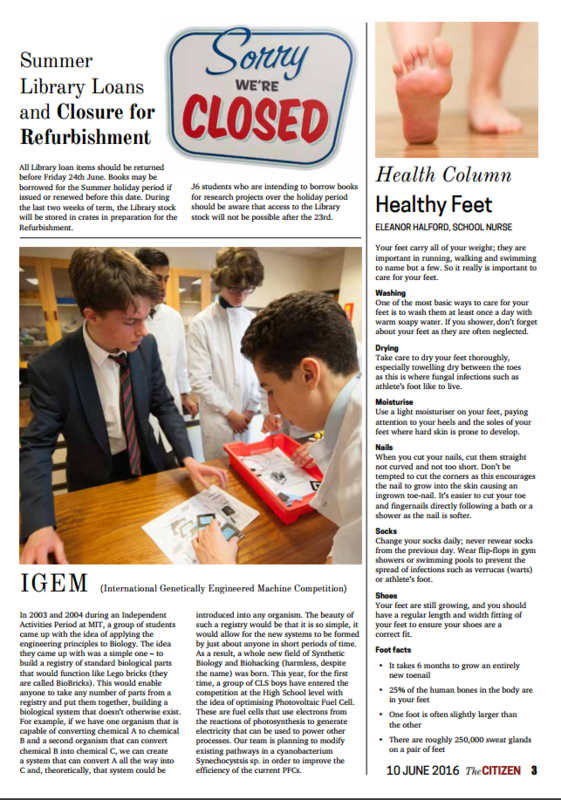 Through this, we are setting up a framework through which future teams can draw from for help and advice, and we also hope this will see greater uptake amongst high schools in the UK for the iGEM competition, there being very few currently. Seralini, Gilles-Eric et al. “Genetically modified crops safety assessments: present limits and possible improvements” Environmental Sciences Europe 23:10 (2011): 1 March 2011.